If the Minnesota legislature does nothing to change the state’s current tax laws, state tax revenues will jump by $850 million (MinnPost). So the Minnesota House and Senate tax committees, as well as Governor Dayton and his administration (Pioneer Press) are working hard to craft a tax bill for approval, yet this session. The task won’t be easy. The job is complex. Time is short. In fact, one legislative leader, Senate Minority Leader Tom Bakk suggests the legislature should extend the timeline to a summer special session. The tax conformity bill creates an opportunity to consider making accommodations at the state level to counter the negative impact of federal tax laws on charitable giving and estate taxes. 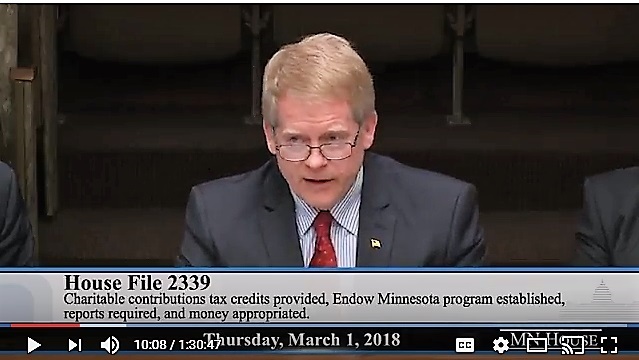 The Minnesota House recently held hearings on the Endow Minnesota tax credit and a bill to expand Minnesota’s charitable giving tax deduction. MCF supports both of these bills. We encourage members (community foundations and corporate giving programs) to contact their representatives and senators who represent their service areas to express support for these two bills. It is particularly important at this time for community foundation board members to contact members of the House and Senate tax committees, as well as those who represent their service areas. MCF is available to help make these contacts.